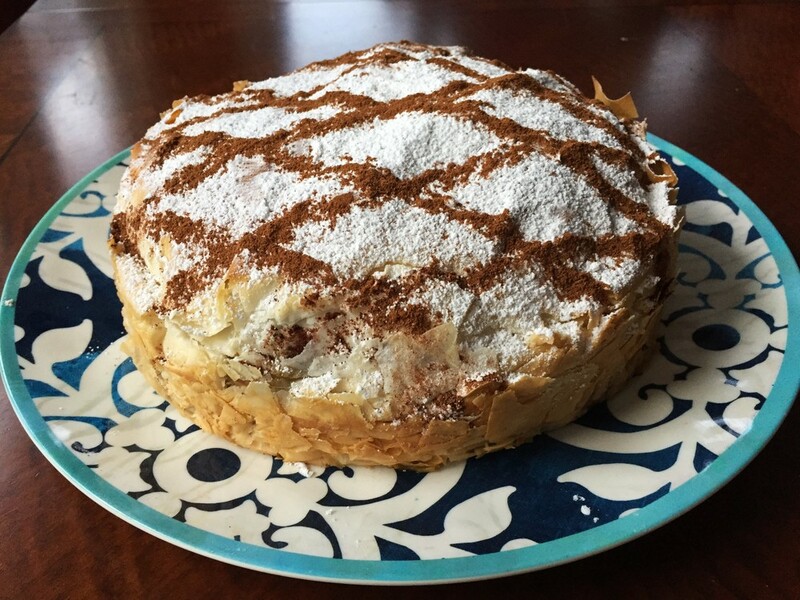 Our tour of pie takes us this week to Morocco in North Africa, where Berber, Arab, Spanish and Persian influences combine in this savory-and-sweet dish. If you are like me, this thought may cross your mind about five times while making this dish. Coming from a European-American cooking perspective, there are several things about this dish that I found surprising. But in the end, the combination of flavors is, unmistakably, just right. Like so many great dishes, B'Stilla is, in many ways, human history on a plate. Combining ingredients commonly found in the Maghreb, spices from Persia and Arabia, traditional Moroccan pastry, and a name derived from Spanish, B'Stilla is the result of a few thousand years of conquest, religious fervor and trade. The first thing an American needs to wrap her head around is that this beautiful cinnamon-sugar pastry contains a savory filling. Despite appearances to the contrary, this is not dessert. This fantastic dish is traditionally served as a starter at festive special occasions, including weddings. Traditional recipes call for alternating layers of sugared-and-spiced almonds, squab, and spiced, scrambled eggs. In our recipe, based on one we found in Saveur, we combine these elements into one filling mixture, nestled in layers of phyllo. As someone who learned to cook in the French method, this goes against every impulse in my cooking body. In case you're not familiar with the vernacular, I'll explain. Fat separator in action. The standard French approach is to use something like this to pour the rich, delicious stock into your sauce, leaving the greasy fat behind. Instead, in this recipe, eggs are used to emulsify the stock and fat into a uniform sauce. In this recipe, the chicken stock is further enriched as it poaches the squab or chicken thighs - check. Then, it is boiled down to reduce it in volume and strengthen the flavor - check. Then as it sits, the one cup of liquid we are left with separates into about half fat and half very-rich-stock. But wait - step away from the fat separator! Now we are going to use that fat in the sauce. This wasn't explicitly explained in the original Saveur recipe, but in my recipe, the beaten eggs are combined with the half-fat-stock to form a smooth, emulsified sauce. Eggs, you see, are one of those foods that contains natural emulsifiers, in this case lecithin. So they can be used to combine oils and liquids into a uniform sauce. Don't you just love science? In Morocco, this dish is traditionally made with warqa, an extremely thin pastry locally available fresh. I've never seen it in the US, and from what I see online, it is pretty tricky to make yourself. Phyllo, another paper-thin pastry from the Mediterranean, is a common substitute outside Morocco. One sheet of phyllo dough lining our springform pan - note that you can see the bottom of the pan through the dough. 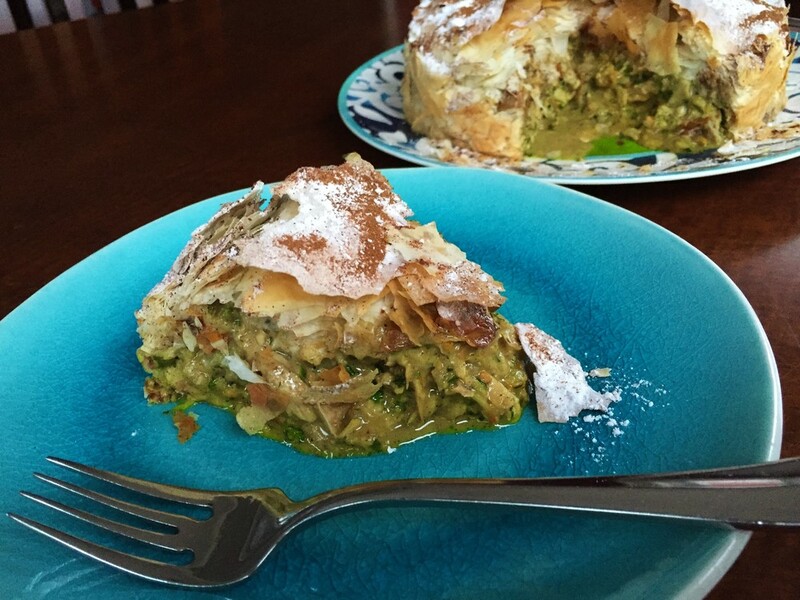 If you've never used phyllo dough before, you are in for a few delicious surprises. The first may be when you take it out of the package. You may wonder why there are so many large sheets of paper where the dough should be? My kids, and the kids in my classes, didn't believe this "paper" was actually dough until I showed them I could eat it and encouraged them to do the same. Phyllo is made with flour and just the tiniest bit of olive oil. It is so paper thin, you can actually see through it. Because of this, you'll want to be sure to keep it covered with wax paper while you're using it, and keep things moving so it doesn't dry out too much. When this eventually does happen, it becomes brittle. It is at this point in the recipe that you may think something is going terribly wrong with this dish. As you assemble the pie, the leaves of phyllo you use to build the layers will inevitably dry around the edges, and begin to tear or break apart somewhat. This is just par for the course. You can use a dab of butter to patch the broken pieces as needed, and just keep moving. Folding the ends of the phyllo over the filling. Note that it is starting to break. You'll just do your best to fold the broken pieces of phyllo over the filling, then use butter to help the layers crisp and puff nicely. Ready for the oven. Note the broken pieces of phyllo on the work surface. The smooth top covers broken phyllo underneath. The first slice of our B'Stilla. We were meticulous in trying to make it beautiful for the shot, but it's still perfectly imperfect. You'll want to use a serrated knife to cut slices of B'Stilla. Use a gentle sawing motion to cut through all those layers of flaky phyllo, and don't go crazy trying to keep everything looking perfect. I've never seen it served in Morocco, but I'm guessing that this is the type of dish where folks don't expect each slice to look perfect. They know it will taste perfect. Moroccan B'Stilla made in the Adventure Kitchen in February 2016. Richly spiced poultry meat wrapped in phyllo pastry and covered with sugar and cinnamon combine to deliver flavor that is, unmistakably, just right. We worked together in class to make a B'Stilla to share. 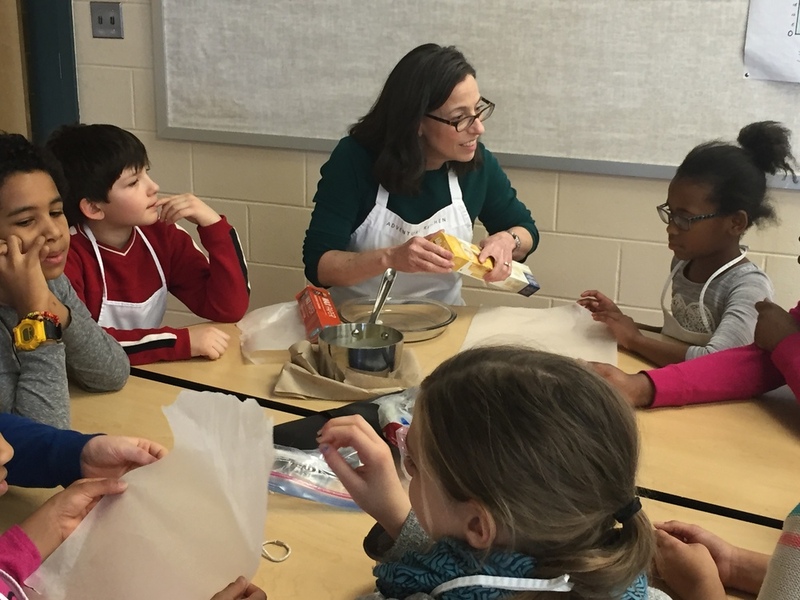 Everyone got to taste the "paper dough"